Welcome to your private, mountain top estate. 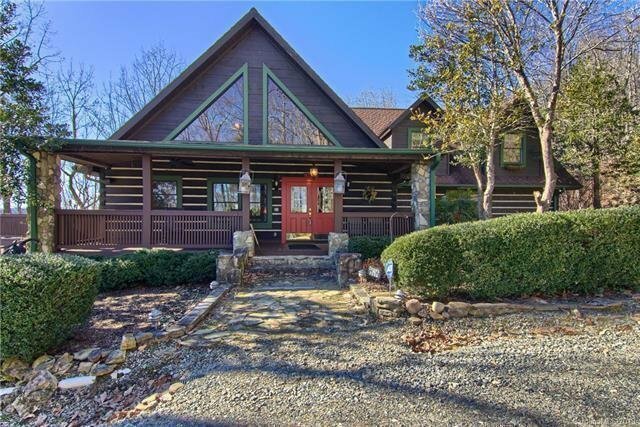 The natural setting and custom LOG home with expansive great room featuring cathedral ceiling, stunning floor to ceiling stone fireplace, a wall of windows, master suite with stone fireplace and sitting room. The lower level boasts a billiards/ recreational room, full size second kitchen and second master suite with stone fireplace. The upper level features an ornate wrought, iron railing with sitting loft, third bedroom, a third full size bathroom and a bonus room w/ closet. Fabulous floor plan, large enough to accommodate family, friends or as a vacation rental. Enjoy hiking/ ATV trails at this mountain getaway. Minutes to downtown Hendersonville and convenient to Greenville, SC. Owner is a licensed real estate broker.